Crisp but warming golden ale with a zesty orange aroma. Sweet, spicy, performed notes join citrus sharpness and gentle herbal notes on the palate. The finish is dry, bittersweet, and hoppy. The beer doesn’t smell like beer at all. It has a wide range across the nose, and smells like a bowl of fruit before a glass of beer. Then the flavor, when you finally raise the glass, is HUGE on the front of the palate as it crawls down the back of the throat. It has a hint of carbonation at first, then it smooths itself out leaving a nice layer of hop across your tongue. The aftertaste is weak, but always present. It’s not spicy, really… I can’t really place what I am tasting here. Also, a beer with this much alcohol should taste like it… this one doesn’t. That means it’s VERY drinkable. It’s not cheap, by the way, and is served in very small bottles. Of course, you can get a big bottle… but you are going to pay for it. This is one of my favorite beers, and until this project I had no idea it was considered an IPA. I would call this a fruit beer… but of course, I am just saying that based on what I smell and taste in the glass. I love this brew, and can’t wait for our next bottle! 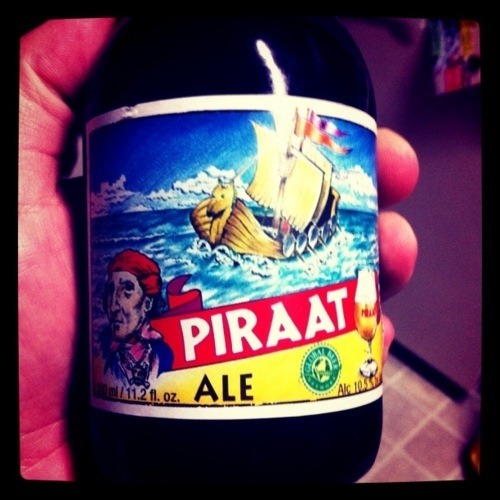 Tonight’s beer is Piraat ale, which I believe I’ve had before. It pours out into the glass as a golden yellow color, almost like a wheat beer. In fact, it looks a lot like a wheat beer. There’s very little head on it, and not really a lot of smell to it, but I guess it does smell kind of “wet” as Ricky sometimes describes beers. I’ve never really know what he meant by that, but I can kind of see it with this one – it does smell sort of wet. It tastes somewhat carbonated, with a rich flavor to it. It does have that normal ale taste, but to me it tastes better than a normal ale. It has more flavor to it. Usually ales don’t really have a lot of flavor to me, which is why I’m not a big fan of them. But this one’s not bad. It has a bit of fruit taste to it, but it blends well with the flavor of the ale. I’ve had beers with fruit flavor that didn’t blend well, but instead stuck out like a sore thumb and just didn’t go well with the flavor of the beer. It goes down smooth and leaves you with an aftertaste that really seems to just taste warm. But it’s a good warmth. This is one ale I might actually consider buying again if I got the chance.